It has been quite a journey to arrive at this point. Through the years there has been a multitude of replicas of the “Old Lady” built by both amateurs and professionals, including two major issues - from Guild Guitars of the USA, and Burns UK - but, as of 2004, I am pleased to say that the commercial Red Special has at last come home. I was concerned that it ought to be me personally who controlled the design and manufacture of these instruments and so I have teamed up with Barry Moorhouse of House Music and Pete Malandrone, my long-time tech man, to create a brand new range, our aim being to make the absolute best products at an affordable price, so that all may enjoy the special sound and feel of a Brian May designed guitar. Inspired by the legendary Red Special, The BMG SPECIAL features superb build quality, awesome playability and an astonishingly rich diversity of killer tones... In fact, it delivers everything you'd expect from an instrument engineered to the unique and exacting standards of one of the world's greatest musicians but with an amazingly affordable price-tag that belies its superior appointments and performance. The best-selling, flagship SPECIAL model gets the custom treatment in this selection of strictly LIMITED EDITION instruments featuring exclusive artwork and striking new finishes and hardware combinations that offer a fresh perspective on the classic BM template. 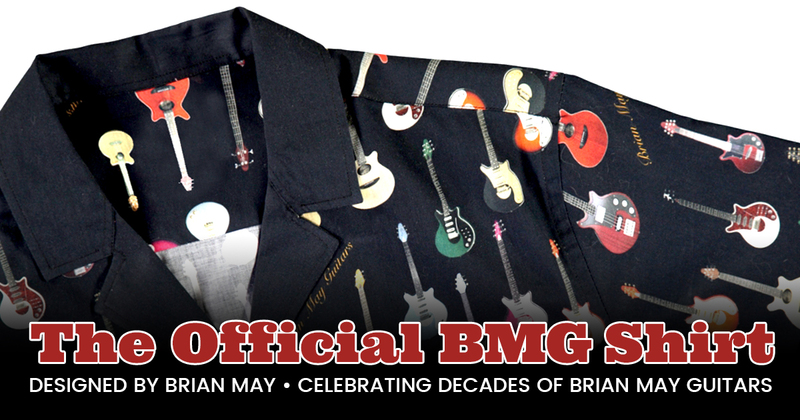 A devastatingly authentic, handcrafted replica of the Red Special, the limited edition BMG SUPER is the result of a all-star international collaboration between Brian May and his long serving guitar tech Pete Malandrone, House Music's Barry Moorhouse, British electronics wizard Adrian Turner, Australian Red Special guru Greg Fryer, Japanese master craftsman Kazutaka Ijuin and the superb luthiers at New Bohemia in the Czech Republic. Every aspect of The Super's construction and appointments - from the acoustic chambered, mahogany body shape and neck profile to the custom made, knife-edge tremolo and exclusive BMG Adeson-spec "Super" pickups - has been painstakingly rendered to replicate Brian's storied original as accurately as possible at a price that won't completely break the bank. The ultra compact MINI MAY returns... still fun-sized, but better. With a longer scale length, lightweight, edge bound poplar body, maple neck, rosewood fingerboard and single Tri-Sonic style pickup, the Mini May is a perfect travel companion. Featuring the instantly recognisable outline and aesthetics of the "Old Lady" herself, the unique BMG BASS is a striking, retro styled, medium scale, twin pickup instrument with a powerful, rich bass response and versatile, aggressive tone. The exact same instrument played by Brian May on the 2016 One Voice tour with Kerry Ellis and on the Queen + Adam Lambert European Summer festival shows, this is a superb, small-bodied, next generation electro-acoustic guitar designed in collaboration with Brian and featuring a distinctive "Red Special" style double cutaway design and serious, professional quality on-board electronics. Another Brian May Guitars original design... THE BMG UKE is a perfect partner for the BMG SPECIAL or SUPER, as well as a fantastic, travel-ready instrument in its own right. Featuring an under-saddle pickup and fully featured Fishman® Kula on-board preamp, this tenor-sized model is equally at home on a big stage or in an intimate, acoustic environment. A selection of original BMG replacement hardware, pickguards, tremolo arms, premium quality branded hard cases and gig bags, Elites superior quality electric and acoustic guitar strings plus exclusive Brian May Guitars apparel, G7th Signature capos and 100% vegan BMG Custom Straps. I came into a Super a week ago. 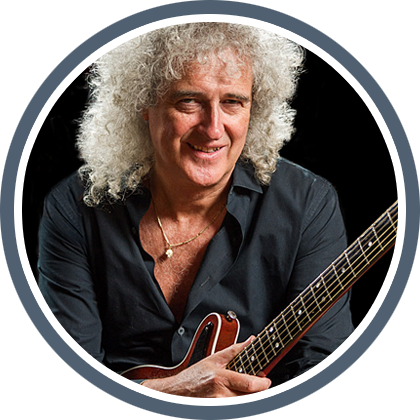 I have to thank Brian May Guitars because they have followed me throughout the procedure, from the first messages up to the payment and the traceable shipping, and they answered every email message and we kept constantly in touch with Facebook chat. The guitar arrived here in impeccable conditions and was also discreetly tuned despite the air travel. It's a faithful replica of Brian May's and I'm having so much fun with the huge neck, the roller bridge and the switch combinations of the pickups... What can I say, my guitar for life! Absolutely recommended - if you can, try it and get one. I absolutely love this guitar, and can't stop playing it. I have a Vox AC30HW2X and its a perfect match (although I do have to turn the amp down to 15 watts). I waited several months for it while some details were worked out on the windings of the pickups (I'm told that Dr. May wasn't happy with a couple batches and wanted these pick-ups to be as faithful as possible to the tonal characteristics of the originals... that speaks volumes to the quality of this instrument). The craftsmanship of this guitar is phenomenal and the detail is exacting, even down to the three strap holes in the end of the guitar (just like the original). The staff at Brian May Guitars was a delight to work with and very helpful with all of the details of the purchase. The sound that this instrument produces is unlike any other guitar I've ever played. There's thirteen (or some such) different combinations. It's like having a Telecaster, a Stratocaster, and a Les Paul all in one guitar. Absolutely love it and can't recommend it enough.